Straw bale gardening is also called bale gardening or mistakenly, hay bale gardening. Whatever you call it, it's a great way to grow herbs and vegetables. It's economical, easier on your back, and is great for people with mobility issues. 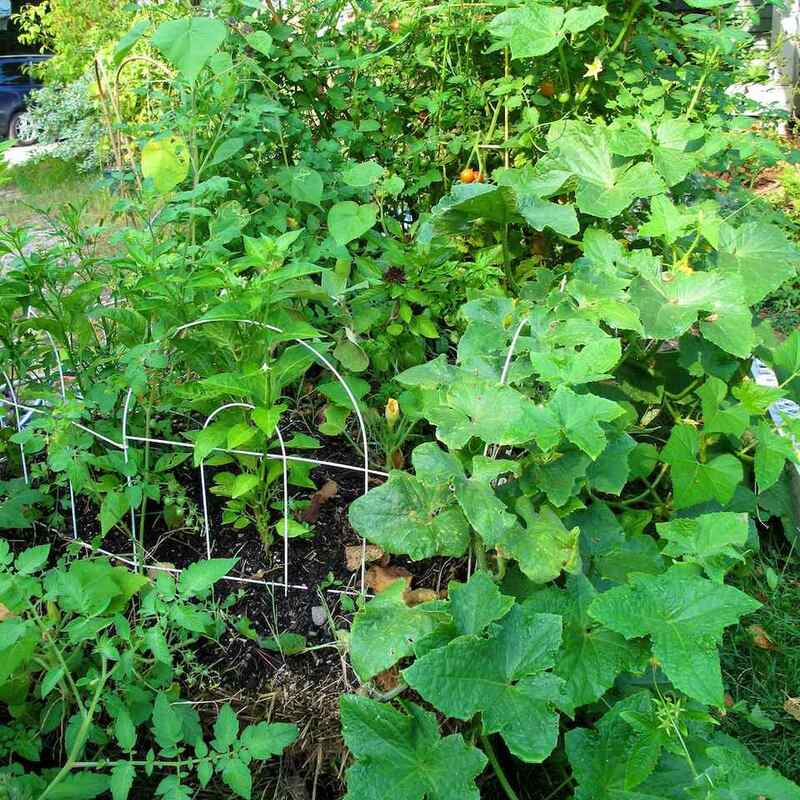 Consider the pros and cons to determine if straw bale gardening is right for you. Don't make a hay bale garden. Use straw. Make sure you get straw bales, not hay bales. This is key because hay bales will have even more weeds than straw bales. If you can, put your straw bale garden near a water source. Any garden takes a fair amount of water and it's helpful to be right near a hose. Try solarizing your bales. If you solarize your bales by wrapping them in black plastic for several weeks before you plant them, you can get rid of most weed and sprouting problems. Take off the plastic before you prep your bales. Be careful of tall plants. By the end of the season, taller plants can cause the bales to decompose and the plants to tilt. You can either grow smaller varieties of tall plants like tomatoes or keep them pruned and have them grow on wider, rather than taller trellises. Make sure you actually have full-sun. Don’t place your bale where water pools. You don’t want your bales sitting in water or your plants will drown. Place your bales where you want them. Once they are wet, they are extremely heavy, and you won’t want to move them. Set up the bales so that the twine holding the bales is horizontal to the ground. Place them sheared side up. Your bale will have one side that looks like each piece of straw has been folded over and the other side will look like it has been sheared off. You want the sheared side facing up. Configure your bales. You can put your bales in rows or create a raised bed by putting them together. Be aware that as the bales decompose they shrink so the spaces between the bales will get larger. Prepping your straw bales is key and takes about a week to 10 days to do it properly. The aim is to have your straw bales start decomposing before you plant them. You want them to start composting which will provide some of the nutrition your plants will need. After your bales are set up, generously spread all-purpose fertilizer on top of your bales. Water in the fertilizer, making sure to saturate every bale, every day for several days. Add more fertilizer every couple of days, spreading it generously, then soak your bales. Put a mix of potting soil and compost on top of the bales so you can plant seeds as well as seedlings on the bales. This layer should be about 2 to 3 inches thick. To plant seedlings in your straw bale, simply take a sharp trowel and stick it down into your straw bale, wiggling it back and forth to make room for your seedling. As usual, make sure to plant seedlings no deeper than they sit in their nursery pot. Also, try to place taller plants in the back of your garden, so that when they grow, they won’t shade the smaller plants. You can also stick plants on the sides of the bales. If you are planting seeds in your straw bales, just do it like you normally would, following the directions on the seed packet. While the height of straw bale gardens makes them inhospitable to some garden pests, there are several critters that will not hesitate to scale your bales and eat your entire harvest. A fence may be mandatory or pests like groundhogs will decimate the harvest. An inexpensive wire fence discourages pests. Water regularly to keep your straw bales moist. In the heat of the summer, this may mean every day. It’s best for plants to water in the morning making sure to water the bale, not the leaves. Excess water will drain out the bottom of your bales so your plants won’t be sitting in water and there is less chance of drowning them. Even though plants will get nutrition from the internal composting of the bales, you still need to fertilize your plants. At the end of the season, you can let the bales decompose, using the remnants the following season as mulch.